What is going on in this picture? 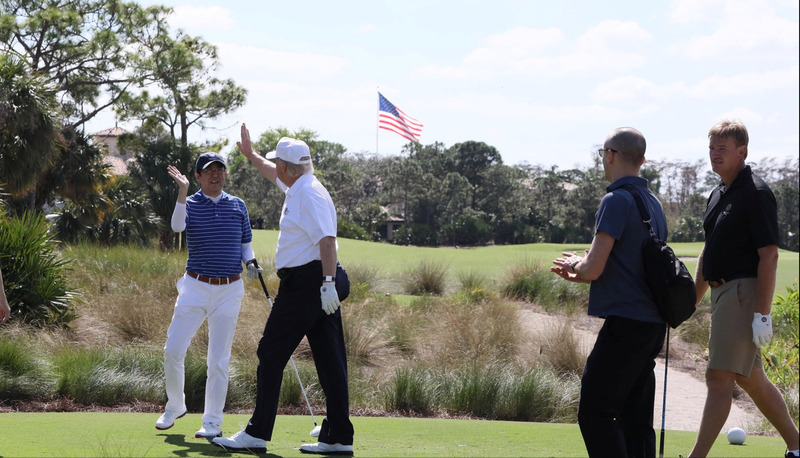 On the surface, it appears to be a fairly innocuous photograph of TRUMP and Japanese Prime Minister Shinzo Abe on the golf course during a pristine day in the Florida sunshine. All is casual, all is relaxed, as both leaders signal a friendly high-5 in their golfing getups. On the right appear to be the caddies, no secret service in this picture, really, it’s just an ordinary Saturday golf game that could be any country club in America where the 1% go about their leisure. But take a closer look, this is no ordinary scene: leaders on the left, caddies on the right, perfectly frame an American flag flying in the breeze. And if you take a closer look, you will see TRUMP’s iconic Mar-a-Lago in the in the upper left hand corner. If you really look at this photo, beyond the glance, you’ll realize that it is completely staged. It is a perfect made-for-media moment. You need to consider all the elements that had to come together for this photograph to be realized. Neither real, nor fake, it lies somewhere in the blurry middle where reality collapses and we are seduced into the suspension of disbelief. This photograph is pure stagecraft. Only a mind with the flair to manipulate reality could have arranged for a press team to photograph the high-5 and the American flag at exactly the perfect moment from the perfect angle. This photograph is no accident, this is TRUMP’s masterful creation of a pseudo-reality projecting a highly crafted image of himself playing the role of statesman. In fact, Prime Minister Abe is merely an actor cued up to this perfectly choreographed made-for-media propaganda. Masterful media constructions such as this undermine our ability to authenticate the moment. It is Baudrillard’s simulacrum used as a political weapon, in which we are manipulated by a representation to be rapidly disseminated as a meme traveling through the network. This “realistic” simulation is particularly well suited to spread online uncontrollably, distorting our interpretation of the meaning of its encoded information, thus eroding our sense of reality. Baudrillard was concerned about the collapse of distance between the real and the imaginary. In today’s post real made-for-media environment, with the transmission of the meme accelerated by the Internet, we see a collapse of the real, a confusion and blurring of the demarcation between truth and fabrication, real and imaginary. And it is becoming increasingly difficult to separate the two in the blurry, murky world where TRUMP resides.